3D printing makes headlines daily as savvy designers come up with new ways to put this developing technology to novel new uses. However, many manufacturers, designers, and entrepreneurs still lack a complete understanding of how 3D printing can improve their business. Prototyping is one of the most challenging parts of product development, especially in today’s competitive markets where waiting too long to release a finished product could cost you the entire business. The newer technology of 3D printing may be better for your needs in a few specific ways. Why is 3D printing so well-suited to the prototyping challenges of today? Well, prototyping is the primary use that inspired the development of this technology in the first place. In fact, before the term 3D printing was coined, it was known only as rapid prototyping. 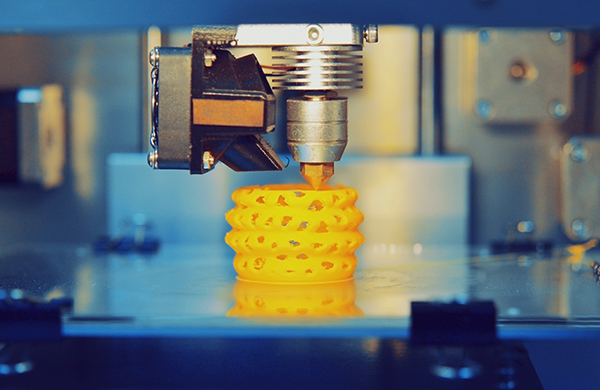 The designers of the first 3D printing devices knew that additive style of manufacturing was faster and more adaptable than subtractive methods like CNC milling. It took a few decades for this new type of prototyping to become common enough to receive its new name, but regardless of what you call it, 3D printing remains a technique optimized for prototyping. Not only are entire products becoming more complex, each part that goes into a finished product is also more complex than ever before. CNC machining costs rise steadily with the amount of complexity in the design, but 3D printing doesn’t have the same kind of adjustments. While some complexities do slightly increase the cost of 3D printing, it’s far more cost effective to use 3D printing for highly complex prototypes than to have them machined. Regardless of material, 3D printing is a faster process than CNC milling in most cases. Even if the actual manufacturing time for both methods is exactly the same, setup and finishing is far faster for the 3D printing prototype. This makes a big difference when you need to make multiple iterations of the same part to get a few details right, or you want to test multiple prototypes and then make changes to each of them separately. There’s less time between versions of a developing a 3D printing prototype, cutting down the total amount of time to market. There can be dozens of different designers involved in the development of a single prototype, making it a challenge for everyone to stay on the same page. Most software options used for creating and editing files used for 3D printing offer sync options to keep everything up to date with less work. The modeling software for 3D printing is also highly advanced but tends to offer more user-friendly controls than the same software for CNC machining. In many cases, the same files created for machining can be used for 3D printing with little to no changes at all, not even conversion into a different file type. If you’re an accomplished designer but you’ve never worked with 3D printing, you’ll find the software easier to learn than the tools used for CNC machine planning. While 3D printing is primarily used for prototyping today, it’s quickly expanding into production of ready to use parts and finished products. It’s also common for companies to pay for CNC machining to produce the first few sets of a product until other forms of manufacturing can be designed, such as specialized tooling or molds. This use is as limited as possible because of the high cost of producing parts this way. 3D printing costs the same to manufacture each part regardless of whether you intend to use it as a product or prototype. When you’re trying to go from prototype to production with the same service while controlling costs, 3D printing definitely wins. Additive methods like 3D printing make the most of every ounce of raw material necessary for creating a prototype. CNC machining is subtractive and wastes the majority of the material cut away from the starting slab or block as the details are carved into the metal or plastic. 3D printing is more environmentally friendly and helps you save money if you’re using expensive materials for specific prototype features. Finally, there is one major limitation to 3D printing that rarely matters during prototyping. While metal 3D printing is now available, the products created in this way don’t respond all that well to most post-processing treatments. 3D printing of metal involves the heating of metal powders to seal them together, so applying more heat is not always a good idea. Prototypes only require metal processing if it’s necessary for the finished product, so most early prototypes are best made with 3D printing to save money until it’s time to test the post-processing. Looking for 3D printing services to get your prototype ready as soon as possible? Explore our listings here at the European Subcontracting Network to find the partners you need.